Birthday celebrations are a great way to express your love and emotions towards your near and dear ones. It does not matter whether you are celebrating the birthday of your child, parent or grandfather: it is an amazing experience for everyone. It is a jolly time for the entire family. If your father's birthday is coming up soon, you need to plan his party in advance so that you can make him feel extremely special on his big day. Here are few tips that can help you in celebrating your father's birthday in a wonderful manner. Check out an exclusive cake for your father- You need to have a sumptuous cake for him on the occasion of his birthday. Find out his favourite flavour from mom and order the same for him. 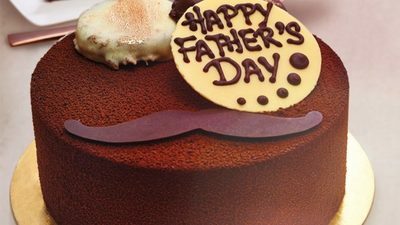 In case his birthday is falling on Father’s day, you can also try the exclusive range of father’s day cake for him. You can easily find cake for father’s day, birthday, marriage anniversary or farewell party online. Prepare his favourite breakfast in the morning- Your father would definitely love the sweet little surprise of getting his favourite breakfast in the morning. You can prepare the choice of breakfast for your dad and place it on his bed side along with a small letter that contains a birthday congratulatory message for him. Buy a perfect gift for him- The birthday celebration of your father would be incomplete without you getting him a nice gift. You can buy a good cotton or linen shirt, a leather wallet, a tie or any other gift item for your dad on the occasion of his birthday. Take him out for a lunch or dinner- On the occasion of your father’s birthday, you can take your family out for a lunch or dinner treat at any of your dad's favourite restaurant. You can offer them a lavish lunch or dinner over there and can celebrate the birthday occasion in an extraordinary manner. Plan out a small outdoor trip- For ensuring a memorable birthday celebration, you can plan out a small outdoor trip with close friends, family and loved ones. Spend a valuable time at a farmhouse, beach or wildlife sanctuary with your near and dear ones. Along with this, you can order the birthday cake for your father and can celebrate the occasion in an outdoor location. Arrange a pool party for your father- If your father loves playing pool with his bunch of friends, why not arrange a pool party for him on his birthday occasion? It will help him in unwinding and will be a great experience regarding spending quality time with his friends. With this extraordinary plan, you can make the birthday celebration of your father a truly memorable affair. Thus, follow these important tips that can help in celebrating your father's birthday in an elegant manner. Remember his birthday is a big opportunity for you to make him feel special and an important part of the family.